For many thousands of years, garlic has been prized for its myriad health benefits by civilizations ancient and modern. Garlic, a member of the lily family and cousin to other alliums, such as leeks, onions, and shallots, has been used medicinally by diverse cultures ranging from the Ancient Chinese to the Vikings. 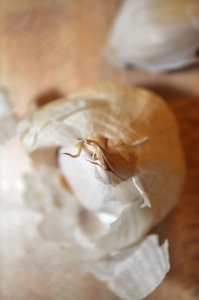 Doctors in Medieval Europe as well as Native Americans used garlic as a medicine. The ancient civilizations of Greece and Rome used it to fortify athletes and manual laborers. Garlic was even considered an aphrodisiac in Ancient India and Ancient Japan. Modern Western science has largely proven what these civilizations have known for centuries, identifying a wide range of compounds and micronutrients in garlic that fight infection, regulate blood pressure, and fight bad cholesterol. Now, how many wonder drugs do you know of that also happen to be the secret weapon in every chef’s pantry? During ancient times, garlic was fed to slaves in Ancient Egypt, as well as laborers in Ancient Greece and Rome, for its fortifying and life-sustaining properties. Historical evidence suggests that the Ancient Egyptians fed garlic to the Hebrew slaves during the construction of the pyramids of Giza. It is recorded in the Bible that, after Moses led the Israelites to freedom, garlic was one of the things they missed. “We remember the fish we used to eat for free in Egypt. And we had all the cucumbers, melons, leeks, onions, and garlic we wanted” (Numbers 11:5). In Ancient Greece, athletes competing in the first Olympic games ate a clove or two of garlic to boost performance. In Rome, garlic was thought to fight parasites and disease. Plague doctors in Medieval Europe used garlic cloves in masks when they handled the sick and dying. It was thought that the presence of these cloves would prevent transmission of the Black and Bubonic Plague. Germs don’t quite work that way, and the masks were ineffective. Nonetheless, garlic remained a champion of natural germ-fighting in Western civilization. In the mid-Nineteenth Century, pioneering French Chemist, Louis Pasteur, discovered the antibacterial properties of garlic. During World Wars I and II, garlic was used by field medics to treat wounds. Medics relied on its antiseptic properties to prevent the onset of gangrene in injuries. Today, garlic is considered to be an effective natural remedy in the prevention and shortening of diseases like the common cold. It is also scientifically linked to a reduction in bad cholesterol and a lessening of high blood pressure when taken regularly by patients. A recent clinical trial has shown that a mouthwash consisting of fresh garlic had showed considerable anti-microbial effects in the mouths of its users. However, the side effects reported by participants included bad breath. So, go figure. Garlic is good for your heart in a variety of ways. Garlic acts as a blood thinner, reducing the ability of the blood to clot, much in the same way that aspirin does. Eating garlic has been shown to have the potential to lower blood pressure, especially in people who suffer from high blood pressure. A variety of scientific trials have shown that regular garlic consumption has been linked to lower blood cholesterol levels over time. Furthermore, there is research that suggests eating garlic can help to impede the development of atherosclerosis, a condition of the hardening of the arteries that can lead to stroke and/or heart disease. Modern science has gone a long way in explaining what all of these garlic loving societies had already figured out the world’s most powerful antioxidant. One of the most recent discoveries has been identifying one of the principal health-promoting elements found in garlic. That would be a vital compound known as allicin. Allicin is a naturally occurring antibiotic that can kill many different kinds of bacteria and microscopic life forms, such as E. Coli, MRSA, streptococcus and a variety of parasites. Allicin is roughly two percent as powerful as penicillin and ten percent as powerful as tetracycline. On top of that, it also possesses anti-viral and anti-fungal properties. Garlic resisting diseases from parasites, microbes, viruses and more: does any of this sound familiar? Allicin is actually not immediately present in garlic. In fact, it is created when an enzyme called alliinase collides with a sulfur compound known as alliin. Alliinase and alliin are found in separate cells of the garlic clove, and come together only when garlic is bitten, chopped, sliced, or crushed. The whole process of creating allicin happens within about 10 seconds of the interaction of alliinase and alliin. Basically, this important health-boosting compound comes from the crushing of raw garlic through preparation and consumption, which is especially good news for garlic lovers the world over. Stuffed onions are a labor of love, and they are worth every stir of your trusty wooden spoon. Stuffed Onions with… https://t.co/OrEtBPkCSd about 10 hours ago from Hootsuite Inc.
Garlic Gold® Pecan Cheese Ball: https://t.co/kXMr9QBQ6y https://t.co/gAB1IUpRvx about 14 hours ago from Hootsuite Inc.